Mr. Yazen’s role at KBBO Group is driven by the goal of the continued growth of mergers & acquisitions in the region as well as elevating the conglomerate to the next level. As a seasoned banker, Mr. Yazen Abu Gulal has a wealth of financial management experience, both locally and internationally. He has successfully completed numerous projects during the last eight years in the financial sector and is known for his excellence and attention to detail. 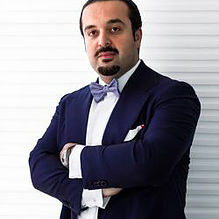 From his early beginnings with one of the UAE’s oldest financial services firms SHUAA Capital, to his latest position as Vice President at Swiss Private Bank Lombard Odier in Geneva, Mr. Abu Gulal has proven his ability to close successful deals with a wide range of high-net-worth individuals in the MENA region. Since then, he has been the driving force behind many successful mergers and acquisitions. In 2017, he relocated from Geneva to Abu Dhabi to lead KBBO Group’s new expansion plans. This includes overseeing acquisitions, investments, and the structuring of new products to reach international markets with a solid product offering. Mr. Abu Gulal is also the Chairman of Emirates hospital.